What do you know about Michigan cherries? Traverse City, Michigan lies on the upper east shore of Lake Michigan. 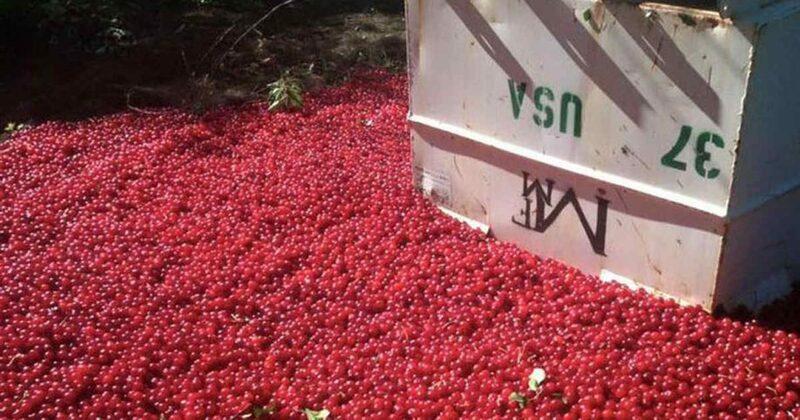 Dubbed “The Cherry Capital of the World”, it’s a hotspot for cherry farms. The regional airport is even called “Cherry Capital Airport”. This area in Michigan grows about three-quarters of the tart cherries in the U.S. It also grows about one-fifth of its sweet cherries. By the likes of it, something is rotten in the state of Michigan. Unless you commercially grow cherries (or other produce) in the U.S., you probably don’t know about this phenomena. According to the U.S. Agriculture Marketing Agreement Act of 1937, the amount of produce an individual grower is permitted to sell is limited. Michigan is one of the many regulated districts with strict limits for farmers. In fact, The Cherry Industry Administrative Board (CIAB) meets once a year to decide what that amount will be for the current crop year based on market conditions and projected Michigan cherry crop yield. If a grower manages to successfully harvest more than the allowed amount, the surplus cannot be used in any way in its natural form. Cherries over the “free market tonnage” may be frozen for another, less-productive year or processed. They may be turned into juice, jam, or other products, but not sold whole. Even selling them at an all-American roadside stand is outlawed. Worse yet, the extra fruit can’t be donated to, say, a food bank or other charity. Plus, growers are compensated for their annual “primary inventory reserve” but not for all the food they are compelled to waste (1). The purpose of the regulation is to control market price through supply and demand. The idea is that too much supply for the current demand will drive prices down, to the detriment of farmers. However, Santucci says, “My concern is we’re trying to limit the supply here, but all that does is increase imports,” (2). In Santucci’s case, he had buyers for his surplus this year but wasn’t allowed to sell. How is that a free market? It appears as though government regulations aren’t in favor of American farmers after all. Similar regulations are in place for other produce (3). Some larger farms have the facilities to use the excess cherries in other products (with other volume restrictions) so the impact to them is somewhat reduced. For smaller farmers like Marc Santucci, this isn’t an option. CIAB inspects cherry farms to ensure the regulation is upheld and that no surplus is being sold. “Waste not, want not” could be put to good use here. To Santucci, it’s not only a matter of revenue, but of principle. If he (as an example) isn’t allowed to sell his excess crop, the door is open for the gap between supply and demand to be filled by imports. He feels that this harms domestic farmers. He also emphasizes that he isn’t averse to the idea of imported cherries if that’s what the market requires. The current legislation, however, was passed during the Great Depression, is antiquated, and no longer supports U.S. farmers. He asks that the produce-eating public contact its members of Congress to repeal the law to make it fair and reduce waste. It’s interesting to note that one of the primary reasons given by proponents of genetically modified crops is to enhance the world’s food supply. Studies have shown that this argument doesn’t hold. 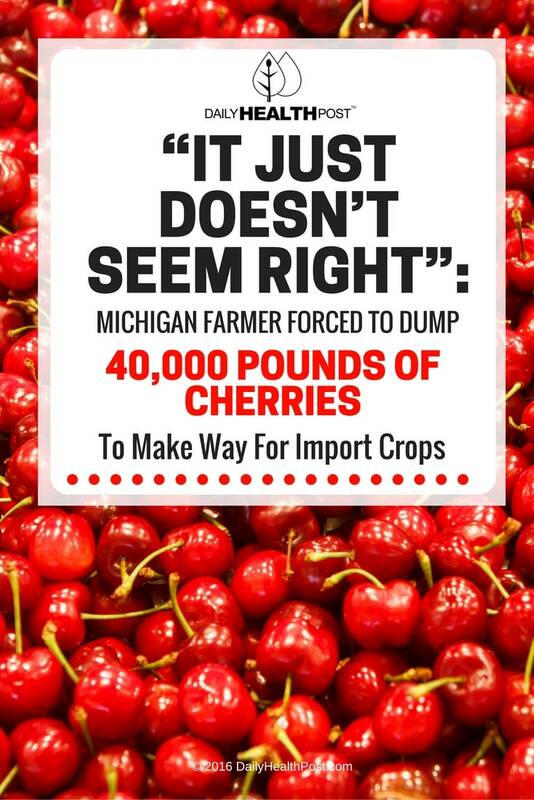 Add to that this report of Michigan cherries as an example of how food is unnecessarily wasted. It’s difficult to rationalize the notion that traditional farming can’t produce enough to feed the world’s population. In this one instance alone, forty thousand pounds of cherries would feed an awful lot of people. Americans (arguably the most affluent and over-fed people in the world) have the luxury of throwing away 40% of the food they buy. Waste has become a sad part of our culture, but it’s never too late to save the Michigan cherries.